Swami Vivekananda was the first among Indian religious teachers who held Illiteracy, malnutrition and narrow-mindedness responsible for paucity, poverty, deprivation of Indians and who recommended spiritualism to tackle the day to day problems and rigors of life. Slavery of several centuries had trampled upon the self esteem of Indians. It was beyond their comprehension that they themselves were capable to turn their fortunes and that education has the potential to be the means and medium for this transformation. They needed an inspirational message. Swamiji discovered this message in the principles of Vedanta. People thought themselves to be immersed in religion, they observed the ritualism, but they were totally oblivious of the public welfare principles of Vedanta. They did not know how these can be employed in day to day practical life. People needed two kinds of knowledge—worldly knowledge to meet their day to day requirements and spiritual awareness for equipping themselves with self-esteem and moral sense. Swamiji stressed the need to learn mundane and worldly things from the west. He maintained that the scientific achievements of the west needed to be emulated. The problem was to apply these thoughts and ideas among people. For this he established Ramkrishna Mission in 1897 soon after returning from the all religious congregation at Chicago . Presently branches of Ramkrishna Mission are active in so many countries; they are contributing valuable services in the fields of quality education, health along with disaster managements in cases of earthquake, tsunami and, famine. Ramkrishna Mission is an untainted name even today. A unique aspect of the personality of Swamiji is that he fulfilled all the responsibilities of a son and brother towards his mother and brother even being a Sanyasi. His love and dedication to his mother was phenomenal. Swamiji did not survive even for a decade after his electrifying triumph at Chicago. Even though he suffered from a number of painful diseases and had to bear with the contradictions of his times, a proper evaluation and appreciation of his immense contribution by scholars of different countries is not complete even after more than a century. 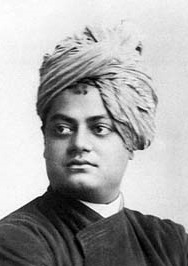 Swami Vivekananda’s lectures and writings have been compiled in ten volumes in English,. It has been possible due to the painstaking efforts of a number of scholars, many of whom are from other nations, such as his shorthand writer Sara Allenwaldo, Sara bull, Lara Grain and others. Margaret Nobel, who was later christened Bhagini Nivedita, Captain and Mrs. Savior, Josephin Mclead, Sara Ole Bull were among his disciples and dedicated friends. Nivedita dedicated herself to the propagation of girls’ education in Calcutta.Swami Vivekananda was the first among Indian religious teachers who held Illiteracy, malnutrition and narrow-mindedness responsible for paucity, poverty, deprivation of Indians and who recommended spiritualism to tackle the day to day problems and rigors of life. Slavery of several centuries had trampled upon the self esteem of Indians. It was beyond their comprehension that they themselves were capable to turn their fortunes and that education has the potential to be the means and medium for this transformation. They needed an inspirational message. Swamiji discovered this message in the principles of Vedanta. People thought themselves to be immersed in religion, they observed the ritualism, but they were totally oblivious of the public welfare principles of Vedanta. They did not know how these can be employed in day to day practical life. People needed two kinds of knowledge—worldly knowledge to meet their day to day requirements and spiritual awareness for equipping themselves with self-esteem and moral sense. Swamiji stressed the need to learn mundane and worldly things from the west. He maintained that the scientific achievements of the west needed to be emulated. The problem was to apply these thoughts and ideas among people. For this he established Ramkrishna Mission in 1897 soon after returning from the all religious congregation at Chicago . Presently branches of Ramkrishna Mission are active in so many countries; they are contributing valuable services in the fields of quality education, health along with disaster managements in cases of earthquake, tsunami and, famine. Ramkrishna Mission is an untainted name even today. Swami Vivekananda’s lectures and writings have been compiled in ten volumes in English,. It has been possible due to the painstaking efforts of a number of scholars, many of whom are from other nations, such as his shorthand writer Sara Allenwaldo, Sara bull, Lara Grain and others. Margaret Nobel, who was later christened Bhagini Nivedita, Captain and Mrs. Savior, Josephin Mclead, Sara Ole Bull were among his disciples and dedicated friends. Nivedita dedicated herself to the propagation of girls’ education in Calcutta.